Blog about Loquacious Lair Of Lautitious Lachrymose paperback and ebook, literature and poetry books published by author Alexander Smoljanovic. 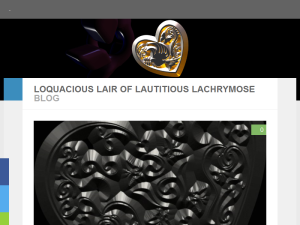 This what your Loquacious Lair Of Lautitious Lachrymose Blog Ad will look like to visitors! Of course you will want to use keywords and ad targeting to get the most out of your ad campaign! So purchase an ad space today before there all gone! Roses Sitting on Death Row is a moderately cynical view about the custom of giving flowers. People have probably been giving cut flowers to others since the beginning of time. I doubt if Adam picked flowers for Eve from the Garden Of Eden. Giving cut flowers to my wife was not usually a surprise since the act stemmed from either obligation or request. The life of cut flowers can be extended using several techniques. Most stem ends can be seared in boiling water for ten thirty seconds to dramatically extend the life of cut flowers. Lilacs require a minute although most flowers require much less searing time. Sachets of food can be added to the vase to slightly extend life. Alkaline tap water in a vase promotes proliferation of bacteria which easily prevented by adding citric juices or vinegar. One drop of bleach can prevent mold and fungus which kills flowers prematurely. I have nothing against people choosing cut flowers but prefer to give potted plants to someone I care about. My wonderful wife has received many roses from me over the years. Potted plants can be moved to a garden or remain planted indoors. Flowers can continue to grow with proper care and maintenance. Many potted roses received from family and friends here in Sweden were subsequently replanted in my front garden. Harsh winters kill a small percentage of garden roses but most manage to survive. aware that no more they could grow. Cut down their life could not remain. No roots to feed on earth below. will quickly vanish from the rose. the life force of the one he chose. Once proud they glistened in the rain. Chopped down they sit and wait to go. the flowers waiting on death row. of golden sun that it once knew. of roses he will give to you. Red roses sitting on death row. Several methods can be used to extend the life of cut flowers. One can dramatically extend the life of cut flowers by searing stem ends. Lilacs require a minute although most flowers require much less searing time. Sachets of food added to the vase can extend the life of cut flowers. Alkaline tap water in a vase promotes proliferation of bacteria which easily prevented by adding citric juices or vinegar. One drop of bleach can prevent mold and fungus which kills flowers prematurely. I have nothing against people choosing cut flowers but prefer to give potted plants to someone I care about. Potted plants can remain indoors for enjoyment or replanted outside in the garden for others to view. Flowers can continue to grow with proper care and maintenance. Many potted roses received from family and friends here in Sweden were subsequently replanted in my garden. Harsh winters kill a small percentage of garden roses but most manage to survive. One of the featured stories gracing the upcoming book entitled Lusory Lore Of Lautitious Lachrymose will be Roses Sitting On Death Row. Other posts by Alexander M. R. Smoljanovic about roses containing significant emotional depth include The Rose You Gave Was Not For Me and Gold Autumn Leaves With Withered Rose. This is the first poem about roses for the new book following the Rednaxela Tried Not To Feel post. Follow us on twitter at @Alexrms and @LoquaciousLair. Visit our FaceBook page When I Feel can also use like and comments. The post Roses Sitting On Death Row appeared first on Loquacious Lair Of Poetry Literature. Rednaxela first made his debut in post Rednaxela The Dragon at smoljanovic.net and subsequently returned in Rednaxela Again Did Rise. Rednaxela Did Rise Again poem provided details about what the battle that continued to rage. Rednaxela Tried Not To Feel is the third poem that completes the story creating a trilogy about the infamous dragon. but in his heart a love did burn. His one true love then did return. to be correct in any way. so fast asleep he hoped to stay. He asked her why she did come back. why she thought true love he did lack. Her words resounded with disdain. that made him feel the war was lost. Emotion ripped his mind apart. He fought to win at any cost. and find out that she was not there. but woke up and did no more care. Rednaxela most recently surfaced once again in southern Sweden a decade after the previous sighting which occurred in 2005. The only battle that raged this time was deep within the heart of Rednaxela. It appears that the dragon was not sure if the return of his love was actually a dream and therefore wished to not awake. Rednaxela eventually faced his version of reality and insisted he did not care. The following image representing Rednaxela Tried Not To Feel is a static image of the animation created for the poem. A post entitled Rednaxela The Dragon Complete Trilogy containing all three poems previously existed on an old website. The author divided the original post placing them on different websites. Rednaxela The Dragon and Rednaxela Again Did Rise was published on Smoljanovic.net in the external post entitled Rednaxela The Dragon. This current post completes the trilogy about the dragon but does not close the door on possibilities. We would appreciate our readers taking a few minutes to follow us on Twitter at @Alexrms and also at @LoquaciousLair. Visit and like our FaceBook page Illusory Realm of Poetry and Enchanted Animated Hearts. The post Rednaxela Tried Not To Feel appeared first on Loquacious Lair Of Poetry Literature. Rednaxela Again Did Rise tells about the infamous Rednaxela dragon that returned to fight again after losing the battle in the first story entitled Rednaxela The Dragon. The infamous dragon was not actually vanquished in the first poem. as flames erupted from below. but I knew that it was not so. to overcome his evil foes. not what the poet did compose. were far from what the truth did hold. that those were merely lies they told. consuming evil in his path. that merely served to fuel his wrath. to love the one that caused his fall. that his true love would go away. and thought true love would make her stay. feeling the knife stab deep his heart. was lost when it fell all apart. Rednaxela was recently sighted in Vaxjo, Kronoberg disputing false reports of his demise in Vancouver Canada. The dragon traveled over five thousand miles as confirmed by satellite surveillance by secret security agency AMRS. We will probably hear from Rednaxela The Dragon again very soon as suggested by unofficial reports. Rednaxela will most likely be in the spotlight one more time. Update: New poem posted at Rednaxela Tried Not To Feel completes the trilogy but the story may not be over. Readers can purchase Illusory Realm Of Poetry Paperback and eBook versions by clicking the image or link of the book below. Readers can purchase Loquacious Lair Of Poetry Paperback and eBook versions by clicking the image or link of the book below. Loquacious Lair Of Poetry on Amazon. Follow me on Twitter at @LoquaciousLair and personal twitter account @Alexrms to keep up with my Loquacious Lair and Illusory Realm Of Poetry posts. The post Rednaxela Again Did Rise appeared first on Loquacious Lair Of Poetry Literature. Love cannot melt a stony heart. You gave me nothing I will miss. It was extinguished at the start. But may still haunt you as a ghost. and see it so much differently. and never will you get from me. and wouldn’t even if I could. my love back even if it should. The sad love poem You Traded All Your Love Away occurred to me as my mind visited fragmented memories of things that once were and could never be again. There are mistakes that we dare not repeat again but sometimes fall in the ‘what if’ and continue with others. These particular memories reminded me how fortunate I was to make the decisions I made during the time of a terrible ordeal. The fields we sow are not always as fertile as we hope for or achieve the results we intend the seeds to bring. Love cannot exist without hate and usually doesn’t. When we find love, we usually find ourselves in an unbalanced relationship where one person is the giver while the other is the taker. Past relationships are proof of how fragile and elusive love can be. Conclusions are drawn from our personal experiences with love and can paint many different versions of what we imagine love to be. Love is what we make of it and will not exist without a conscious effort to keep it alive. Love does not simply vanish for no reason. It disappears when it is purposely willed out of existence. The degree to which we believe love to be real is directly proportional to how real we imagine it to be. This poem appeared in the first book published entitled Illusory Realm Of Poetry and follows the post of a categorically similar poem Prove That You Love Me. Visit and like the corresponding Facebook page – You Traded All Your Love Away. The post You Traded All Your Love Away appeared first on Loquacious Lair Of Poetry Literature. A loving relationship can last a lifetime or inexplicably fade away. Some relationships appear to go on as usual but harbor hidden resentment or hatred. Partners in a relationship may falsely continue to claim their love long after it has been consumed and converted to dust. It may be better to hear the truth instead of the hollow sound of an untrue “I love you”. Unbalanced relationships may have a partner that still clings to the notion that love still stands a chance. Some relationships are totally devoid of love and exist primarily for public show. The following poem is best classified in the categories of love poetry, sad poetry and sad love poetry. before we further drift apart. Show me now that you truly care. Reveal the love within your heart. feeling that I should go away. Your words tend to obganiate. Choose carefully the words you say. What we have now remains unclear. There seems no reason more to wait. and wonder if it is too late. You state your love but show it not. Your words no longer ring so true. You can’t give what you haven’t got. Your words match not the deeds you do. Long days ago you filled my dreams. Once you could melt a heart of stone. that I am now here all alone. Reveal the emptiness you hide. Prove you can love me once again. Show me intentions that are pure. Remove the things that cause me pain. It is not pleasant to endure. The Prove You Love Me animated heart was flattened into a static image and is shown directly below. Prove That You Love Me poem is a selection of poetry that will be published in the new book entitled Loquacious Lair Of Lautitious Lachrymose. There is no set date for publication but efforts are in place to release a paperback and eBook version with a year. The new book will contain all new poems. More info is available in the first post New Book Launched. Some material will be used to continue stories which began in Illusory Realm Of Poetry and Loquacious Lair Of Poetry. Please take a few minutes to follow us on twitter at @Alexrms and also at @LoquaciousLair. Visit and like our FaceBook author page Alexander M R Smoljanovic. The post Prove That You Love Me appeared first on Loquacious Lair Of Poetry Literature. A new book launched and scheduled for publication will be entitled Loquacious Lair Of Lautitious Lachrymose. Loquacious Lair Of Lautitious Lachrymose will be the third book published by author Alexander M. R Smoljanovic. The new book is expected to be released worldwide in eBook and paperback versions within a year. Two published books preceding this one are Illusory Realm Of Poetry and Loquacious Lair Of Poetry. Some of the content in the new book will include poetry intended to complete some of the stories previously told and also begin new ones. I Still remember Nights she cried is an example of poetry that may be included. The following poem probably best fits the categories of sad, nonfiction poetry based on personal experience. and knew life would not be the same. and felt I should accept some blame. and rarely came to say hello. my mother always loved me so. that this would be the very last. while others then had not much hope. there was so much with which to cope. when death had visited her bed. to say the things I could have said. I still remember when spending time with my mom even after many decades. She loved to draw birds and flowers sitting at the kitchen table while I stood there and watched. Birds and flowers were included in the animated heart created for the poem in memory of her. The following image is a static version of the original animation. A poem selection entitled Prove That You Love Me was published in a recent post. CreateSpace is one of the many distributors that carry the paperback versions of Loquacious Lair Of Poetry and Illusory Realm Of Poetry. Don’t forget to follow us on twitter at @Alexrms and also at @LoquaciousLair. Visit and like our FaceBook page Alexander M R Smoljanovic. Check out our other site Smoljanovic Illusory Realm Poetry And Conceptual Art for more original poetry. The post New Book Launched appeared first on Loquacious Lair Of Poetry Literature. If you are the owner of Loquacious Lair Of Lautitious Lachrymose, or someone who enjoys this blog why not upgrade it to a Featured Listing or Permanent Listing?